This year, almost 100 protesters gathered in Charleston, West Virginia on January 20th as part of the third nationwide Women’s March. 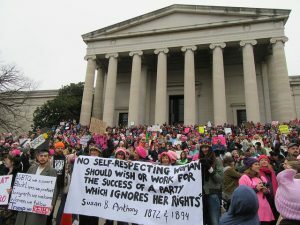 This march was one of many sister marches that took place across Appalachia this past weekend. In cities like Washington DC, thousands of protesters crowded the streets. The first Women’s March in January 2017 after Donald Trump’s inauguration drew over 3 million protesters; in 2018, over a million people marched. The public often regards the Women’s March as an event rather than a vibrant movement, but it is actually a structured organization led by a national board of six well-known activists. In Huntington, West Virginia, the Women’s March transformed into an ever-growing social justice movement in the southern part of the state. The Huntington chapter has participated in over 50 marches, demonstrations, rallies, vigils, and other actions since it began in 2017. The group in Huntington meets twice a month. They call their meetings “huddles” and most groups in the state “huddle” once or twice a month. They discuss current events, plan actions, and sometimes host guest speakers. 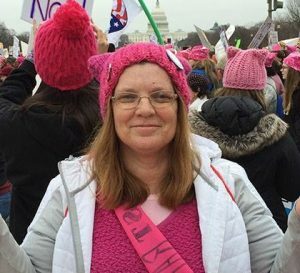 The Women’s March organized against the amendment, but Barbara Garnett, co-president of the WV Women’s March and captain of the Huntington chapter, wasn’t deterred. 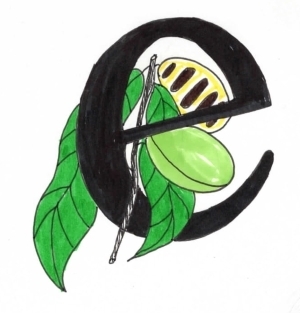 “We fought against that very hard,” she said in an email, “and although we lost the battle, we continue to fight the war.” This will likely be an issue with women’s groups across the state in the coming year. Actions by this group are not limited to “women’s issues,” however. They have held a vigil for the war in Syria, protested the Trump administration’s immigration policy, and more. 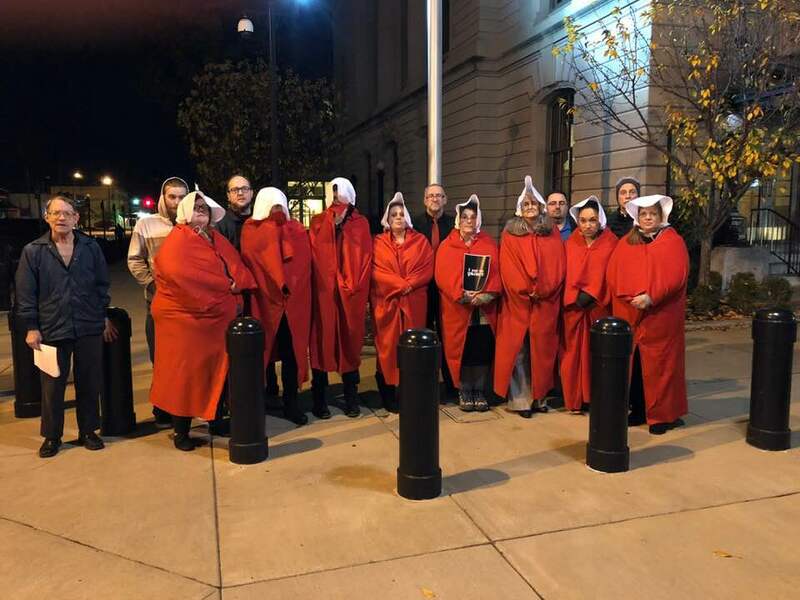 One of their more attention-grabbing actions protesting the Trump administration was inspired by The Handmaid’s Tale, a novel by Margaret Atwood adapted into a television series. They also plan an action related to the ongoing government shutdown. because I knew that the man who was elected would not be very sympathetic to the needs of women, the poor, people of color, people of other faiths, or the LBGTQ community. His main interest is in maintaining his own wealth and the wealth of his rich white male friends. In other words, basic human rights supposedly guaranteed by the Constitution would be under attack. It turns out that largely my predictions have come true, starting with his treatment of Muslim immigrants shortly after he took office, followed by his treatment of immigrants from central America, his empathetic responses to actions of white nationalist extremists, and more. Barbara Garnett, 2017 Women’s March, Washington, DC. The Unity Principles mentioned by Garnett are part of the intersectional platform released by the national organization. These principles include taking actions for ending violence, reproductive rights, LGBTQIA rights, workers’ rights, civil rights, disability rights, immigrant rights, and environment justice. The national and local groups are linked by a commitment “to dismantling systems of oppression through nonviolent resistance and building inclusive structures guided by self-determination, dignity and respect,” according to the Women’s March national mission. Trumpocolypse – health care demonstration. Though the organization has expanded nationally since its 2017 beginning, the 2019 Women’s March turnout was lower than the previous two, as noted by The New York Times. 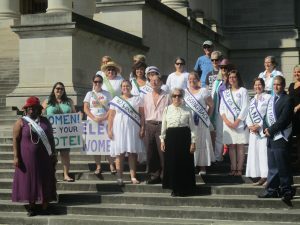 Many West Virginians decided to stay local and attend the rally at the West Virginia State Capitol building in Charleston. The movement will have to keep going for a while. Just because he won’t be president anymore doesn’t mean that there isn’t still a lot of work to do. A lot of damage has been done to this country over the past couple of years. We’ve taken giant steps back in terms of civil rights and environmental protections, and we will have lots to do to ensure that all Americans have access to affordable health care, just to name a few. National leaders have also acknowledged their goals to push the organization to focus on elections and achieve concrete political victories in the future. The Huntington group is an active force in West Virginia, but it is not alone. Within the Mountaineer State, there are many groups of women organizing such as the Women’s March, WV League of Women voters, Moms Demand Action, and others. Those groups are not the conservative, passive Appalachia often shown in media. If you are interested in getting involved with the group or reaching out to the Women’s March Huntington group—go to a meeting! 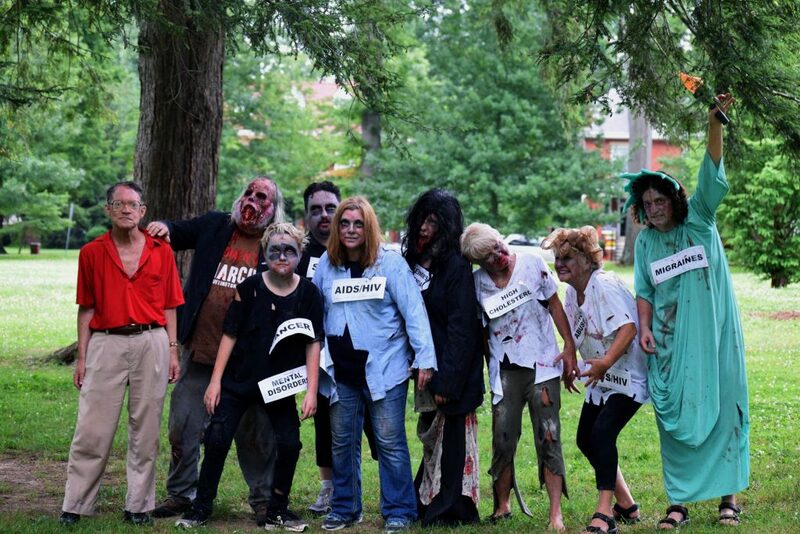 The group meets twice a month at the Cabell County Public Library. Or reach out to the organization on Facebook and Twitter. Alena Klimas is a writer and cofounder of expatalachians. Klimas is passionate about community and economic development in West Virginia. To learn more about the expatalachians team click here.